The Kirtana AmritaSREE SHG in Kundalloor started in 2008. It is part of a cluster that comprises more than 100 SHGs. 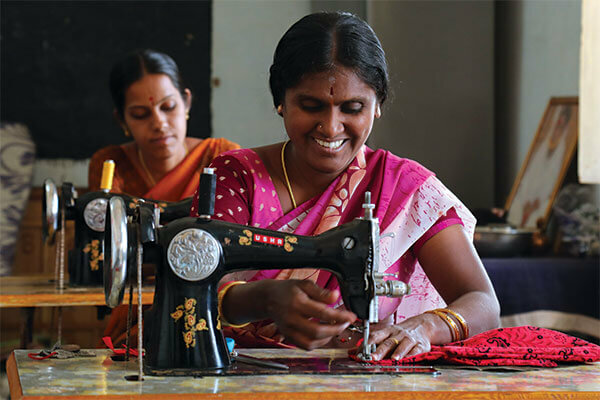 All the members of Kirtana SHG were trained in tailoring by vocational trainers from Amritapuri Ashram, which coordinates training between AmritaSREE and MSME. Following the training, the SHG members decided to concentrate on buying cloth wholesale and sewing nighties. They sell it to other SHG members and to neighboring shops. They sew more than 300 nighties a month and make around Rs. 125 rupees profit per nightie.